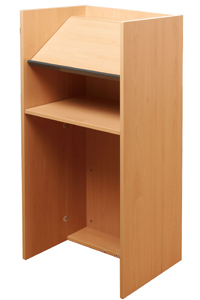 Robust floor standing wooden lectern in beech effect laminate with large sloping reading shelf and accessory shelf. The shelves and two hinged side panels fold flat to aid moving and storage. Sloping shelf has book/ paper ledge for aiding presenter. Finished in beech effect with tough ABS edging. Only 190mm deep when closed. Size when open: 1240mm H x 620mm W x 460mm D, and weighs c29Kg. Click image for view of front and when folded.